Science experiments are all about fun. Though they require a certain level of caution, the results are sometimes breathtaking. And this simple experiment will leave you amazed. A man threw a pot of boiling water into the air, in subzero temperatures, and it turned into icicles. 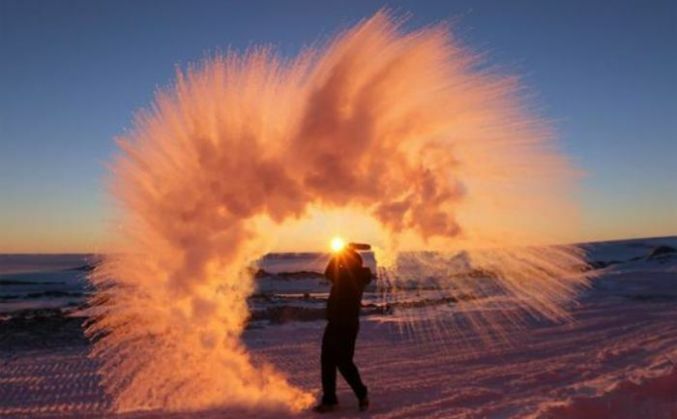 As temperatures dipped to -25 degrees, this man demonstrated the fascinating effect freezing temperatures have on exposed boiling water which was thrown into the air. The water instantly turned to a frozen gas-like state. "....it involves the gradient between the hot water and the freezing air. Boiling water is in a state nearer to gas and is less viscous that colder water which is technically nearer to ice. When the boiling water is thrown into the air it falls into tiny droplets that vaporize instantly due to their high ratio of surface area to volume. However, cold air is unable to hold clouds or vapor and so it clings to the sodium or calcium particles in the water and crystallizes."